SUBHEAD: A “cash ban” is a form of technological dictatorship, in the hands of the world’s billionaires. 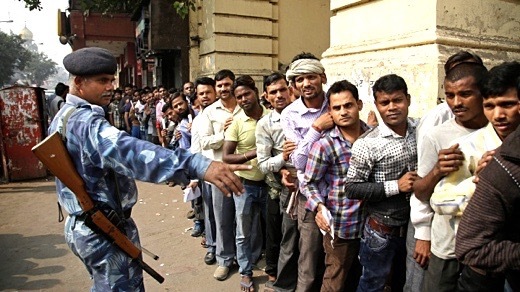 Image above: An Indian paramilitary soldier asks people to stay in the queue to deposit and exchange discontinued currency notes at a bank in New Delhi, India, Saturday, Nov. 12, 2016. From (http://www.cp24.com/world/millions-crowd-banks-to-exchange-currency-after-india-demonetizes-high-value-bills-1.3157742). As 2017 begins and we flounder in our mad rush to force all of India into a digital economy overnight, it is worth pausing and reflecting on what the digital economy is, who controls the platforms and lines as well as some basic concepts about money and technology which have moulded our lives and freedoms, based on patented systems that are failing the people of “West”. Obsolete systems are moulding our patterns of work and our wellbeing — as a very large country, and as an ancient civilisation — into a cast that is observably too small. Meanwhile, the hard working honest people, like farmers, workers in self-organised economies (mistakenly called unorganised and informal) are not just being pushed into deep poverty, they are, in fact, being criminalised by labelling their self-organised economic systems as “black”. The Swadeshi economy is being labelled as the “shadow economy”. “Short term pain for long term gain” has become the slogan for the dictated transition to a digital economy. But the pain is not just short term, the pain of millions of honest Indians who contribute to a truthful economy, wasting days on end, sacrificing their work, their livelihoods, their means of living, to standing at ATMs and juggling denominations and news reports. In rural India daily mile-long walks to banks have become commonplace, whereas rural communities would interact with the “financial world” a handful of times annually. Bill Gates and company made money through patents on software that were developed by brilliant people; they merely own the “workshop” — owning all the work that happens under their roof. Mr Gates used his monopoly to eliminate rivals and then to ensure that no matter what kind of computer you wanted it had to have Microsoft windows. If at this point, you think to yourself: “What about Apple Inc?” a quick search will enlighten you — Alphabet (Google), Facebook, Amazon, Apple and Microsoft controlling shares are held by the same handful of private investment funds. This VC-armada is led by Vanguard Inc.
As he perceptively observes in the Guardian: “In social networking Mark Zuckerberg has cunningly inserted himself (via his hardware and software) into every online communication that passes between his 900 million subscribers, to the point where Facebook probably knows that two people are about to have an affair before they do. Two sets of means come together in what is now declared the real reason for demonetisation — the digital economy. Money making and tools for money making have become the new religion and the government policy has been reduced to the facilitation of the imposition of the digital empires of the new moghuls. Why else is every department of government directing its energy at making Indians “digitally literate”, precisely at a time where people in technological societies are turning to India to learn her wisdom, her deep values of “Sarve Bhavantu Sukhna”, and the ability to live in community as one Earth Family — Vasudhaiva Kutumbakam? We haven’t learnt from the atomised, alienated, lonely individuals that the souls of Western societies have been reduced to. The digital economy is a design for atomisation, for separation, to allow Indians to become individual consumers with abundant “red money” — credit. Mahatma Gandhi’s teachings about resisting empire non-violently, while creating truthful and real economies in the hands of people, for regaining freedom, have never been more relevant. Wealth is the state of wellbeing; it is not money. It is not cash. Money has no value in and of itself. Money is merely a means of exchange, it is a promise. As the notes we exchange state: “I promise to pay the bearer the sum of…” and the promise is made by the governor of the Reserve Bank. On that promise and trust rests an entire economy, from the local to the national level. At the very least, the demonetization circus has “busted the trust” in the Indian economy. In the digital economy there is no trust, only one-way control of global banks, of those who own and control digital networks, and those who can make money mysteriously through digital “tricks” — the owners of the global exchange. How else could the exchange traded funds like Vanguard be the biggest investors in all major corporations, from Monsanto to Bayer, from Coca Cola to Pepsi, from Microsoft to Facebook, from Wells Fargo to Texaco? • Vandana Shiva trained as a physicist prior to dedicating her life to the protection of India's biodiversity and food security. She is the author of numerous books and the recipient of numerous awards.